Is Iran Violating the Interim Agreement? Is Iran violating its obligations under the Joint Plan of Action interim agreement? Secretary of State John Kerry says no. The International Atomic Energy Agency (IAEA) says no. But Foreign Policy claims that parts of a confidential report cite an unnamed state alleging that Iran violated certain terms, and that “diplomatic sources” said that the unnamed state was the U.S.
Foreign Policy apparently does not have the full report, but if you read the article carefully, and if you are willing to trust the unnamed sources, you will see that the article talks about violations of U.N. agreements, not the Joint Plan of Action with Iran. Does Israel spy on the US? Will the US prevent a nuclear-armed Iran? Does Marco Rubio understand global warming science? Is the #BringBackOurGirls campaign working? Read the answers after the jump. I strongly recommend that you read this fascinating exchange between former US ambassador to Israel Michael Oren and Foreign Policy’s David Rothkopf. It’s somewhat long, but it eloquently addresses many of the questions and concerns that trouble thoughtful friends of Israel. Chuck Hagel defended Israel against spying allegations. In response to a Newsweek report quoting unnamed US officials accusing Israel of espionage, Secretary of Defense Chuck Hagel said that “I’m not aware of any facts that would substantiate the report.” Hagel, on a three-day trip to Israel, also affirmed the strong bond between the US and Israel and noted that US aid to Israel is at record levels. We will prevent a nuclear-armed Iran. Many critics of the interim agreement with Iran refuse to acknowledge that its purpose is not to end Iran’s nuclear weapons program. Its purpose is to delay progress on Iran’s program so that we can negotiate an end to Iran’s nuclear weapons program without Iran using the time during negotiations to make significant progress. Iran must not get a nuclear weapon. As President Obama said in Jerusalem, “America will do what we must to prevent a nuclear-armed Iran.” As the United States and our P5+1 partners engage in negotiations with Iran on a long-term, comprehensive agreement that resolves the world’s longstanding concerns about Iran’s nuclear program, we all have a responsibility to give diplomacy a chance to succeed. But America won’t be satisfied by mere words. We will only be satisfied by verifiable action from Iran. Put simply: if we are not, there will be no deal. And, as these negotiations progress, we continue to consult closely with Israel every step of the way. 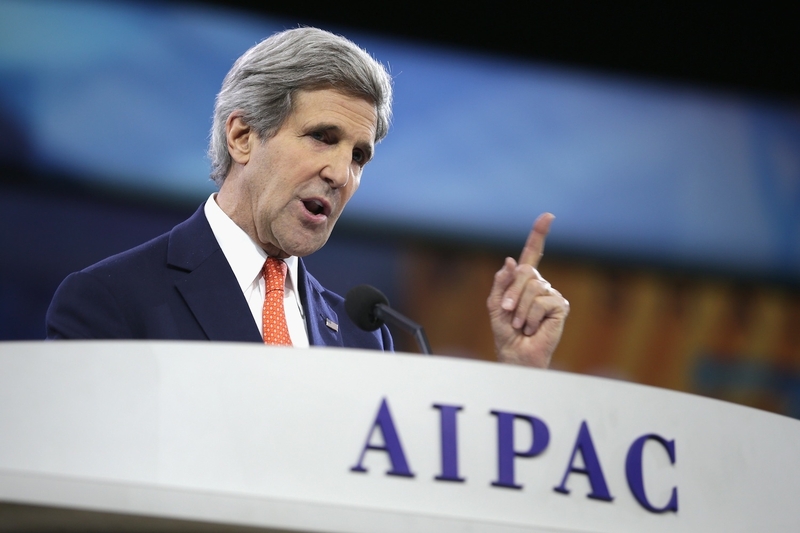 My regular readers know that I’m a strong supporter of AIPAC, and I explained why in my report on AIPAC and J Street. But the disagreements we have with J Street do not negate the fact that J Street is a pro-Israel organization. If you’re really concerned about J Street and the fanciful charges that have been leveled against it, you owe it to yourself to read Setting the Record Straight, by J Street’s founder and Executive Director Jeremy Ben-Ami. I have long noted an interesting phenomenon in the opinion of some American Jews that criticism of particular Israeli government policies from a more liberal position are a betrayal, while even harsher attacks on efforts by Israeli governments to pursue peace talks are entirely legitimate. John Oliver and Bill Nye show the world how to debate with climate change deniers. Sen. Marco Rubio (R-FL) denied global warming science. Rubio proved that he is both ignorant of science and eminently qualified to be a GOP candidate for President by denying the reality that global warming is caused by human activity. Jeffrey Kluger explains why Rubio is wrong on climate change. This is the same Marco Rubio who, when asked the age of the earth, said “I’m not a scientist, man.” No kidding. Kluger’s article is a great article to send to anyone who still doesn’t get it on climate change, but Carl Hiaassen’s approach works too. I wonder if those mocking #BringBackOurGirls would have mocked the “Save Soviet Jewry” posters many synagogues put on their lawns not too long ago. The point of the “Save Soviet Jewry” signs was not that the signs themselves would free Soviet Jews, but that by constantly calling attention to their plight, we would make action more likely and more likely to succeed. Hashtags are today’s signs. No one thinks that hashtags on Twitter are a substitute for action, but they are helping focus the world’s attention on the plight of the kidnapped Nigerian schoolgirls. Zach Beauchamp explains why #BringBackOurGirls is making a difference for Nigeria. These negotiations will be very difficult, but they represent the best chance we have to resolve this critical national security issue peacefully, and durably. While implementation is an important step, the next phase poses a far greater challenge: negotiating a comprehensive agreement that resolves outstanding concerns about the peaceful nature of Iran’s nuclear program. As the United States has made clear many times, our absolute top priority in these negotiations is preventing Iran from obtaining a nuclear weapon. We have been clear that diplomacy is our preferred path because other options carry much greater costs and risks and are less likely to provide a lasting solution. We are clear-eyed about the even greater challenges we all face in negotiating a comprehensive agreement. These negotiations will be very difficult, but they represent the best chance we have to resolve this critical national security issue peacefully, and durably.